So today we had an intense but fascinating day in Chisinau. 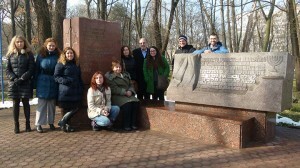 After breakfast, we went to the city tour to explore Jewish history of Moldova and its capital. 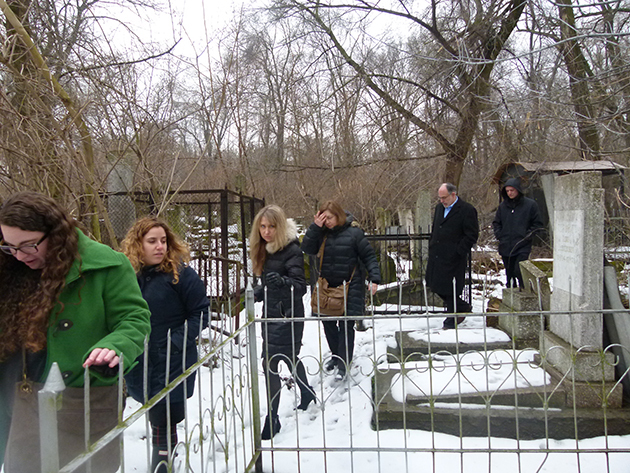 Among many sights, especially memorable was tour inside the old Jewish cemetery. 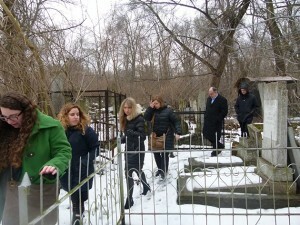 There, we saw the graves of pogroms 1903 and ‘05 victims. We got on and off the bus multiple times and had a chance to walk around. It was very-very muddy around, which proved to us how impoverished the country is. At the end of the tour, we visited “central” synagogue of Chisinau and Moldova. I put quote marks there, because it hardly represents a Jewish community that once was here. Out of 77 (!) synagogues in 1940, there is just 1 left. And the Rabbi, who is 92 years old, has no successor who would wish to take his role after he retires. After having a delicious lunch in the local restaurant, we met with Michael Shuv – JDC Director in Moldova. He was an eye-opening speaker who shared with us the situation in both Moldova and Jewish community in particular. People here are very poor. For example average pension for elderly is $80, while the prices in grocery shops are as high as in Europe! So without JDC, vulnerable Jews here would have a really hard time. Tired but enthusiastic, we continued our day in Israel Consulate with the Vice Consul and Israel Cultural Club Director. They told us about how the institution operates in Moldova and which programs are organized for Jews, Israelis and others. For dinner we had an amazing traditional Moldavian dish and then went to the last meeting, in Moishe House with its past and future residents (it’s in the transition mode right now). We had a lovely chat with many interesting people and learned a great big deal about how the community works from inside. However when we came back to hotel, we saw on the news that there was violence going on in Kiev, with victims and injured people. We hope we still going to be able to spend some time in Odessa and so far we felt extremely comfortable and safe thanks to amazing organizing done by Rise and our guide Dasha. We are looking forward to have safe travels and productive day tomorrow.